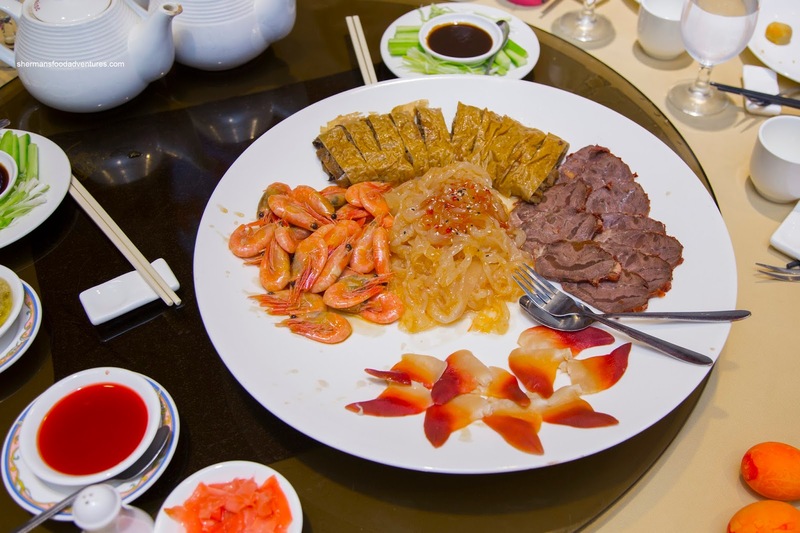 As with any Chinese banquet meal, the Appetizer Platter arrived first sporting sliced beef shank, hokkigai, shrimp, vegetarian goose and jellyfish. If we could describe this dish with one word, it would've been "sweet". It was if they forgot there was other ways to flavour the items other than sugar. 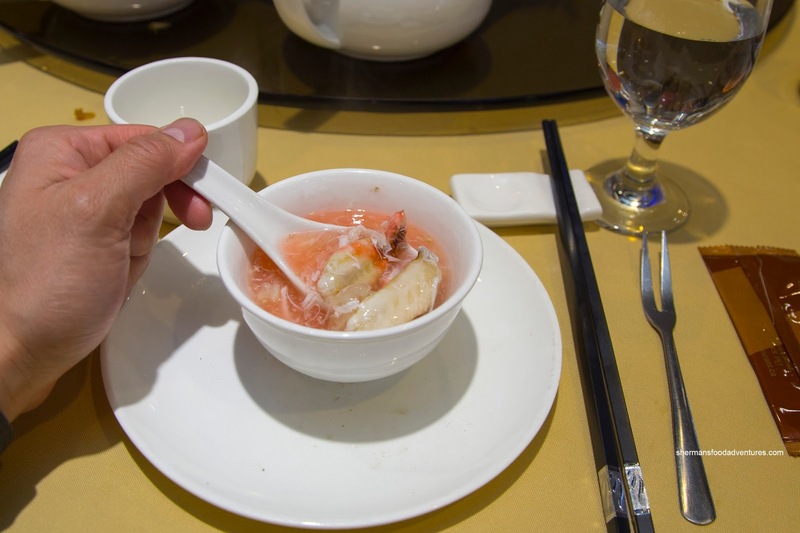 With that being said, the texture of the jellyfish was pretty good being buttery with an elasticity. The shrimp were a bit annoying to eat since they were so small. 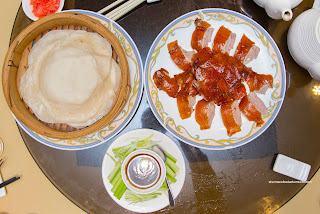 Next up was the Peking Duck carved table side. They left a significant amount of meat attached to the crispy skin. I liked how the layer of fat was pretty minimal. We moved onto the Fish Maw and Crab Meat Soup next. Although it was watery in consistency, the broth did have impact with a muted sweetness accented by the soft fish maw and large pieces of fluffy crab meat. 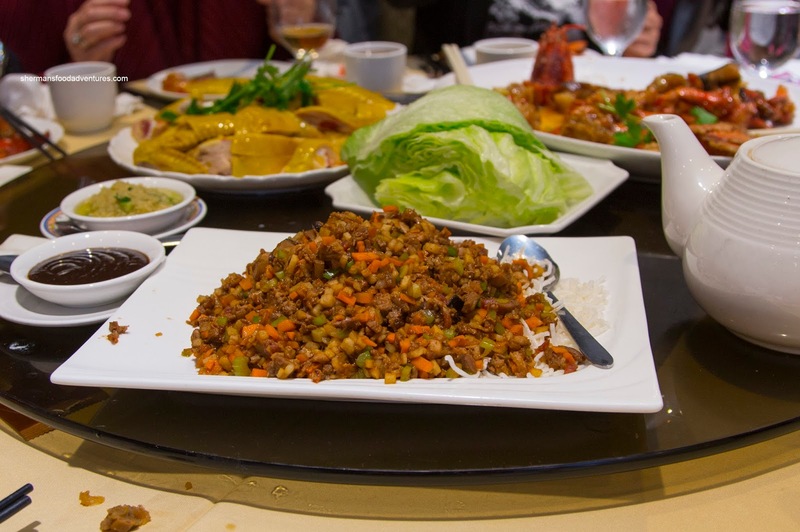 The second course of the Peking Duck was the usual Duck Lettuce Wrap that was subjected to enough wok heat. Hence, there was plenty of caramelized flavours to go with the nice addition of Chinese sausage. Interestingly, there wasn't enough lettuce for all of the filling (similarly to the duck skin and crepes). 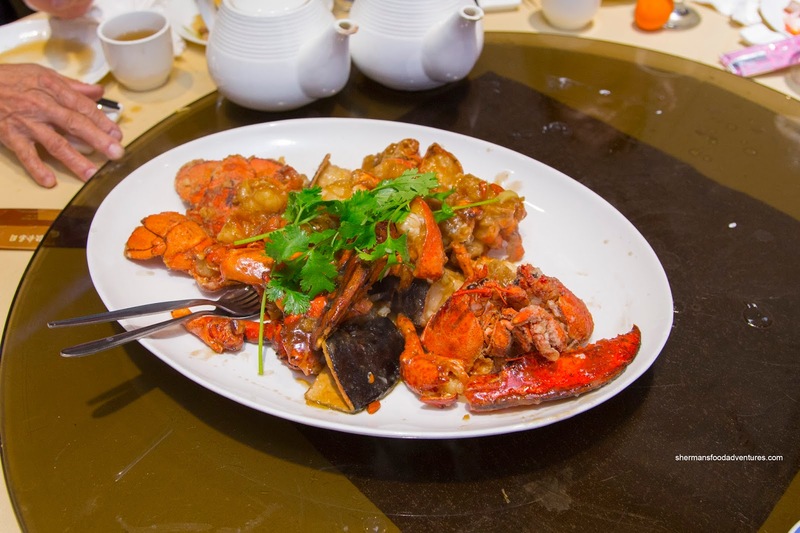 For our main seafood item of the meal, we got a pair of Lobsters prepared in a consume sauce. I liked how there was just enough sauce to coat each piece without being goopy or too wet. It was on the saltier side though. As for the lobster itself, one of the two was rather scrawny and hence a bit overdone due to the lack of meat. The other one was okay though with sweet bouncy meat. 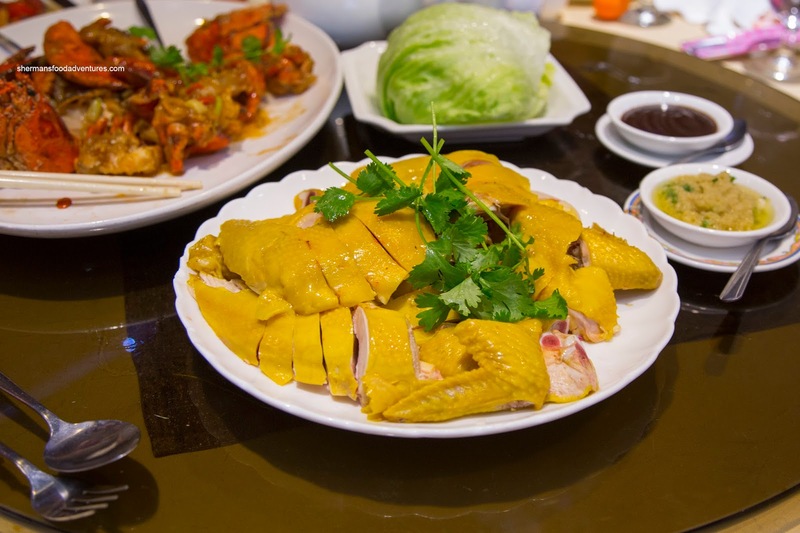 Graced with an artificially colour enhanced skin, the Free Range Chicken was prepared very well. Beneath the gelatinized skin was moist and almost juicy meat. It was well-seasoned while the condiment of ginger and green onion was on point. Now for the most bizarre interaction of the night. 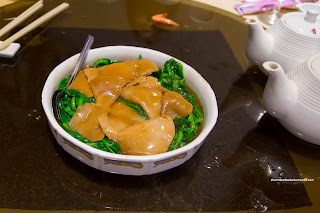 When the Abalone Mushrooms & Pea Shoots arrived, my MIL confidently proclaimed it was sliced abalone. To which I replied, "no, that is not abalone". 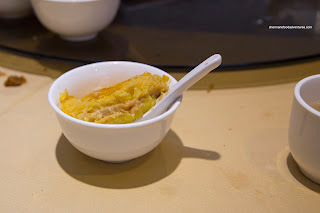 It was actually abalone mushroom which was toothsome and buttery while the pea shoots were overdone a tad. After we were done, she looked at me and spelled out "abalone mushroom" as if I was the one who thought it was abalone. 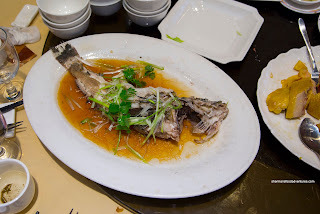 I could do nothing but face palm... After than, there was no mistaking the Steamed Rock Cod dressed with scallions and sweet soy. We found the fish to be obliterated being chewy and almost dry. 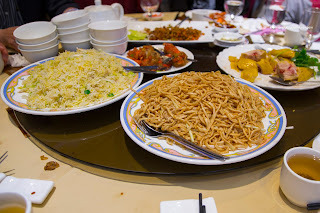 From this, we moved onto the usual ending dishes - Chow Yee Mein and Chicken & Lettuce Fried Rice. Although a bit firm and "wet" where it lacked enough wok heat for caramelization and sear, the noodles seemed to be coloured by dark soy rather than being flavourful. The noodles ate like they were merely tossed around with sauce. As for the fried rice, it was terrible. 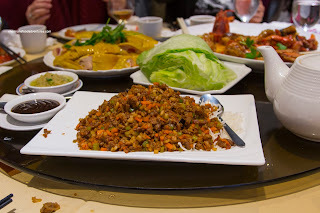 With clumps of mealy and dry rice, this was not fried rice. 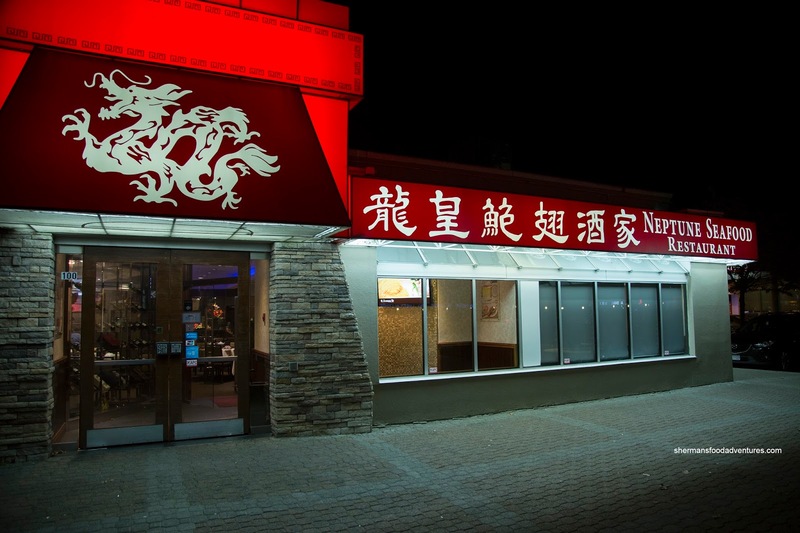 There was a lack of flavour, wok heat and nuttiness associated with fried rice. Again, it looked like they merely tossed it around without actually stir-frying it. 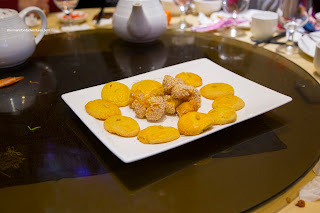 For dessert, we were served the usual Cookies as well as Baked Tapioca Pudding. Cookies were fine, but the tapioca pudding was not very good. It was not even remotely hot where the pudding was stiff and dry while the butter crumb pastry topping was wet and not fully cooked. At the very least, the lotus paste filling was not overly sweet. The faults of this dish as well as a few others could be partially forgiven because it was a multi-course banquet type meal. 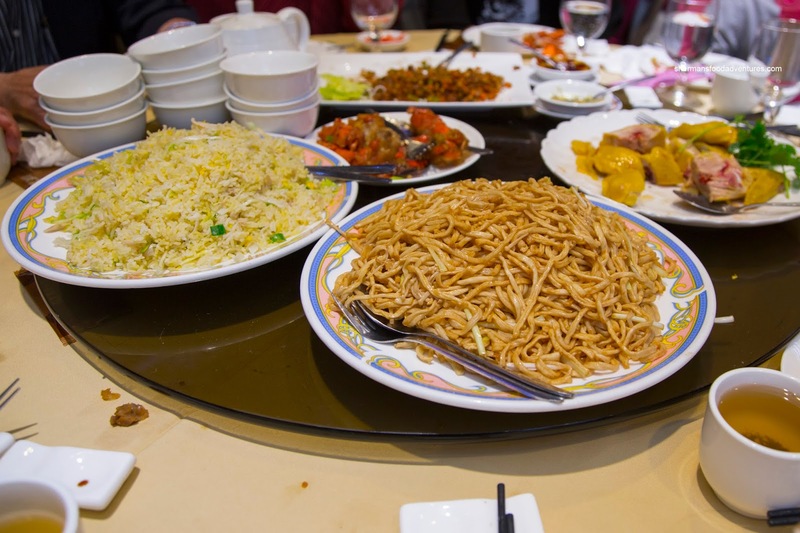 It is hard to execute with consistency with the volume of food. 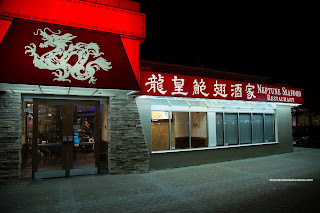 However, there still needs to be a minimum level of quality, especially a restaurant of Neptune's class. If we take that into account, the meal was lackluster at best.